Summer ends late here, as the warm temperatures we’ve recently experienced have shown. Only now, with Halloween looming, are many of us turning off our air conditioners in favor of our heaters, which makes now a good time to get your system checked for any problems, and repaired if any are found. 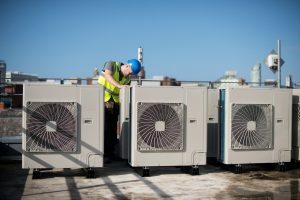 This goes doubly true for commercial properties such as office buildings and retail spaces, which need a reliable air conditioner to do business and might not have been able to shut it off before now because their operations depend on it. The good news is that commercial AC services are available and we can handle any issues your commercial space may need. It’s important to utilize a service with experience handling specific commercial AC systems. Why? Simply put, because commercial air conditioners are much different than residential systems. First and foremost, commercial air conditioners needed to cool a larger space than residential systems in most cases. But that’s just the start of the differences. For example, hot air tends to rise, which means that the upper stories of a given office building are much warmer than the lower stories. Since most residences aren’t higher than three stories at the most, the cooling specifics become much more complex. On top of that, many commercial properties house multiple tenants, each of whom may require very different cooling needs. And many businesses need air conditioners to provide more than just comfortable conditions. Key components like computers need to stay cool regardless of the conditions outside, and if you’re storing product on site, it needs to stay cool as well. A good commercial service company starts with a company that understands the specifics of your system. That allows the technician to identify the problem quickly and conduct repairs the right way. But it goes beyond that. Speed. In most cases, a commercial AC repair service needs to move fast. A residence can sit tight and hold on for repair if needed. But a broken AC in a commercial space can be disastrous. Not only can it damage computers and other key components, but it can send customers away in droves, or at least leave them with a distinctly negative impression of your space. It will also impact the efficiency of your employees: forcing them to work in unpleasant conditions or sending them home. Flexibility. On top of that, a good commercial AC repair service offers emergency calls in the middle of the night or on the weekends. This doesn’t necessarily need to involve an immediate emergency. You still have a business to run, after all, and an AC repair service moving through your space can be very disruptive. Emergency services can work after hours to get the problem dealt with before your team comes back to work, helping you get back to regular operations with minimal disruptions. The friendly professionals at Greenleaf Heating & Cooling offer quality commercial AC repair service throughout the Pasadena, CA area. Contact us today to make an appointment.